Mr. Zhao is a 54 year-old man from mountainous region of Hebei province. He plays a very important role in his family, and is the main person that makes money to support the whole family. 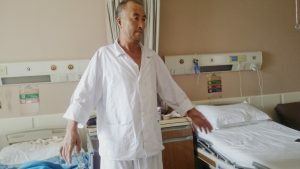 On July 19th 2017, he accidently fell from 3 meter high place when he was building the house for his nephew. He was unconscious, could not move upper limbs and right lower limb after the accident. After 14 days treatment at a local hospital, there was no obvious improvement except for right lower limb movement has slightly recovery, his bowel control was poor. Then he was transferred to one hospital in Beijing and was diagnosed as bilateral brachial plexus nerve injury. The doctors there think the surgical risk was high and recovery rate was extremely low, and he will spend all his life in bed. He was despairing after hearing the doctor’s words. He even intended to commit suicide. Later on, one of his family’s friend recommend Puhua Hospital to them, and he went to Puhua for a second opinion. Physical examination: Muscle strength of upper limbs was 0/5. Muscle tone was weak, muscle contraction was noted, no limbs movement. Based on his former test results, BPIH’s medical team excluded brain injury and high paraplegia. To confirm his diagnosis, we decided to repeat MRI and find the exact injured nerves. During the MRI scanning, Dr. Yanni Li worked closely with the MRI specialist. At the same time, neural nutrition and medication were applied. Lead by Dr. Yanni Li, a multiple disciplinary consultation was held to study the patient’s symptoms and investigations. During the consultation, brachial plexus injury was excluded, considering the patient’s symptoms and MRI results. The conclusion was drawn that it’s a case of Spinal Cord Injury, at the level of C3-T1. With the diagnosis of spinal cord injury, our doctors started the treatment accordingly. Our medical team encourage the patient that the treatment will be very helpful for his recovery. With continued rehabilitation training, he could recover soon. 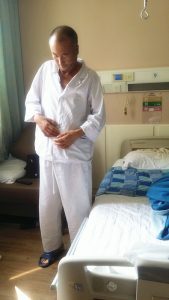 Aug 4th the 3rd day of hospitalization, Mr. Zhao’s condition is significantly improved, he is able to move upper limbs independently. Mr. Zhao regains hope and excited to cry. He expressed his gratitude to Dr. Li and her team. 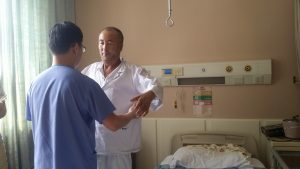 Dr. Li is very delighted to see his improvement. She told him to insist advisable rehabilitation training to achieve further improvement. 3rd day: Mr. Zhao’s condition is significantly improved, he is able to move upper limbs independently. Dr. Li told Mr. Zhao to keep rehabilitation training. Triceps reflex was enhanced, he could stretch his forearm and walk with help. His fingers movement becomes more flexible. He also felt numbness in arms, which is the sign of neural recovery phase. The patient’s muscle strength of upper limbs is still improving, he is able to rotate both arms. On Aug 11th, muscle strength of right upper limb restored to 4-/5, left upper limb 3/5. The flexibility of all joints became better. Doctors started gradually to reduce medicine dosage. Mr. Zhao is ready to discharge. Now he is able to get off bed easily, walk, lift arms and button up. Mr. Zhao is getting off bed easily. He can button up by himself. Before leaving the hospital, doctor told him to keep rehabilitation training. Now, after dramatic improvement, Mr. Zhao’s is full of happiness. He is so grateful for the experienced and well-trained medical team at BPIH. He felt blessed he didn’t give up and chose BPIH after he was misdiagnosed. 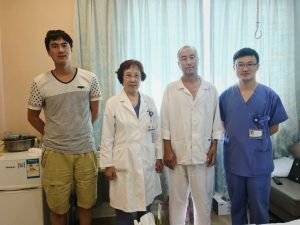 Mr. Zhao and his family are taking photo with doctors. We are looking forward to seeing Mr. Zhao’s further improvements.